104-Key Keycaps | DREVO :: Game With Cool Tech. 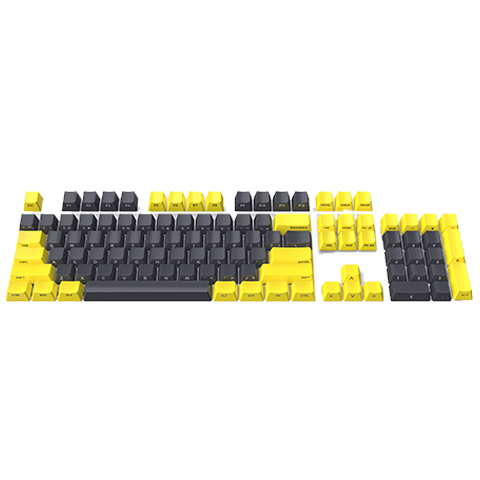 The key caps are available in four different patterns created with a mix of gray and yellow keys. You choose the set, you swap the caps, then you game on with your new custom look on your keyboard. The DREVO keycaps are made from ultra-durable PBT with 1.5mm thick walls. These key caps present a non-shiny/matte top surface. You will always maintain a zero-shine matte look. With PBT being superior to ABS, you can be sure that you are using the best key caps available. The key characters are laser etched on the front side of the caps giving your keyboard a unique aesthetic. This also means that you will never wear off the etching. All DREVO keycaps are standard profile and created for Cherry MX switches and MX clones. It's compatible with your 87-key or 104-key keyboard from brands like Cooler Master, Ducky, IKBC, Filco. Fully compatible with: 87-key and 104-key keysets from brands like CoolerMaster, Ducky, IKBC and Filco. Incompatible with: Razer, Gigabyte, Corsair, Logitech G910/G710, and Steelseries M800. High-quality PBT keycaps, with a great feel, lasts much longer than ABS keysets. 1.5mm thickness OEM profile with Laser marking front print delivers a simple and clean legend. Non-transparent keycaps with a yellow and grey color combo makes it look vintage. Easy to install, includes a keycap puller tool which makes it convenient to pull out keycaps. Standard 104 key ANSI US keycaps, suitable for most 87, 104 key mechanical keyboards with Cherry MX switch, Outemu, Kailh and Gateron Switches.